Powder coating is one of the most durable surface finishes utilized today. It is used across a wide array of industries including aviation, marine, and military applications. Powder coating is a type of coating that is applied as a free-flowing, dry powder. The main difference between a conventional liquid paint and a powder coating is that the powder coating does not require a solvent to keep the binder and filler parts in a liquid suspension form. The coating is typically applied electrostatically and is then cured under heat to allow it to flow and form a “skin”. The powder coating process involves three basic steps: Part preparation or the pre-treatment which is the removal of oil, soil, lubrication greases, metal oxides, welding scales by mechanical process. Next is the powder application process; an electrostatic gun is used to spray the powder onto the metal structure. The gun imparts a negative electric charge to the powder, which is then sprayed towards the grounded object. The last step is curing, this is when the powder is exposed to elevated temperature, and it begins to melt, flows out, and then chemically reacts to form an interconnected structure. The cure process requires that the material reach a temperature of 350°F for 12- 15 minutes time in order to reach full cure. 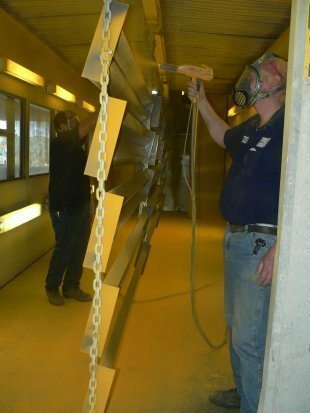 There are many advantages to using Powder Coating vs. liquid coating. One advantage is powder coating is highly protective of our environment. While liquid finishes contain solvents which have pollutants known as volatile organic compounds (VOC’s), powder coating contains no solvents and release negligible amounts, if any, VOC’s into the atmosphere. 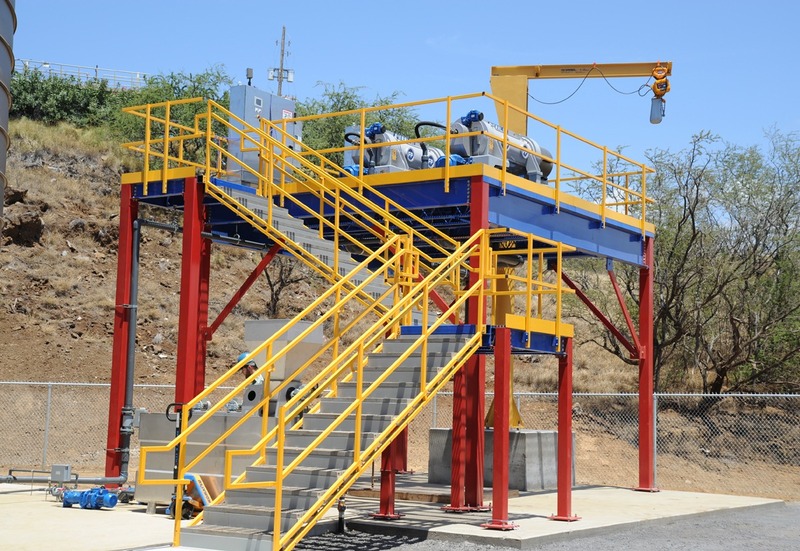 Therefore, there is no longer a need for finishers to buy and maintain costly pollution control equipment. Powder coated items generally have fewer appearance differences between horizontally coated surfaces and vertically coated surfaces than liquid coated items. The coat is tough, durable, and long lasting; has excellent hardness and abrasion resistance which in turn provides improved product performance over most liquid coatings. Another great benefit of powder coating is that it can produce much thicker coatings than conventional liquid coatings without running or sagging; giving your finished product a sleeker and smooth looking finish. All Panel Built, Inc. steel products are powder coated with a 4mill finish at our own facility (shown at right); saving you time and money! 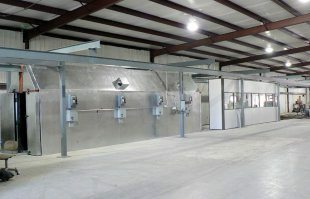 Call 800-636-3873 FREE today to receive a free quote and drawing for your next mezzanine project.